In addition to all of the holiday events in Philadelphia in November and December, there are also several ongoing Christmas attractions to enjoy throughout the holiday season in the City of Brotherly Love. Each of these is a wonderful way to soak in the holiday spirit, spend time with family, and even get a chance to meet Santa! From the Adventure Aquarium's annual Christmas celebration to an enchanted colonial village in the Please Touch Museum, Philadelphia is full of Christmas events and attractions perfect for the whole family. Wander through dazzling lighting displays, take a few laps around the ice skating rinks, and enjoy all the seasonal delights this city has to offer this holiday season on your vacation to the nation's first capital. Explore the following events and plan your next winter vacation to Philadelphia—with all these events to choose from, your whole family will find something to enjoy in the biggest city in Pennsylvania. There's no better way to get in the Christmas spirit in the northeast than to visit a holiday village like the ones found throughout Philadelphia; these villages often offer visits with Santa, colorful displays, and local vendors for Christmas gifts. More than 50 vendors in wooden booths sell their wares at the annual Philadelphia Christmas Village in LOVE Park (in the heart of Center City), where guests can purchase last-minute Christmas gifts of everything from jewelry and ornaments to arts and crafts, meet Santa and get a picture near the huge Christmas tree, or even take part in one of many special events held between the day after Thanksgiving and the day before Christmas every year. Dickens Village at Macy's Philadelphia also opens the Friday after Thanksgiving and runs through the end of December and offers guests the chance to take a picture with Santa, personalize a teddy bear in a design studio, and visit a Christmas gift shop at "Holiday Lane." Once an exhibit in the Lit Brothers department store, The Enchanted Colonial Village is now on display at the Please Touch Museum in honor of the holiday and lets visitors experience scenes from a colonial village, including a toymaker, blacksmith shop, and bakery, or check out one of the special pop-up holiday events like the "Chanukah Wonderland" or "Joy of Christmas" celebrations. Although much of the downtown area and sections of different neighborhoods are adorned in a plethora of Christmas lights over the holiday season, there are also a few places to go to see dazzling lighting displays in and around the city. Inside the Comcast Center in Center City, you can watch the free 15-minute Comcast Holiday Spectacular show on Comcast's massive 2,100-square-foot LED video wall every hour on the hour from Thanksgiving through New Year's Day. You can also check out the Macy's Holiday Light Show, a Philadelphia holiday tradition since 1956 which features over 100,000 lights and is accompanied by music from the Wanamaker Organ. The Holiday Light Show runs every hour on the hour starting at 10 a.m. November 26 through December 31. There's also a number of special features, exhibits, and attractions that only open during the holiday season in the City of Brotherly Love. 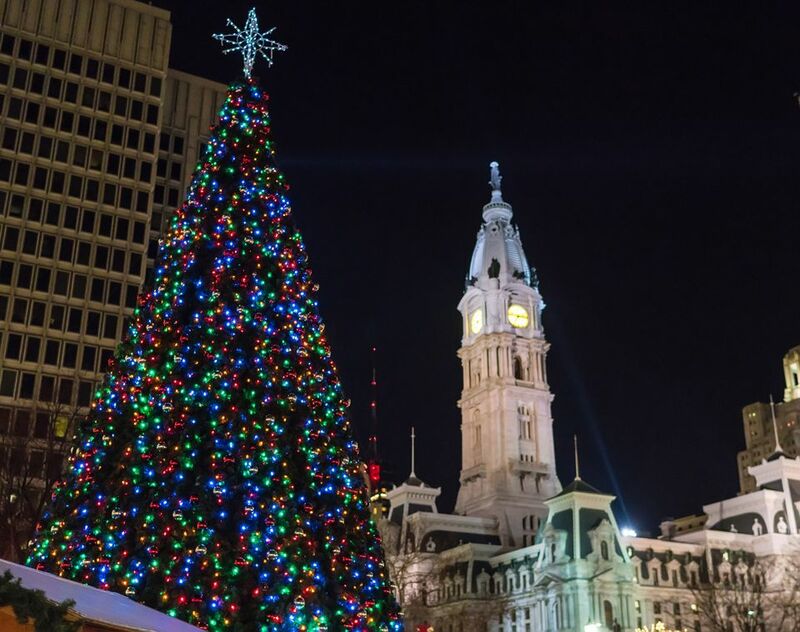 These great Christmas celebrations can completely change your next family vacation, so check out some of these options below before you travel to Philadelphia for the holiday season. Center City's Franklin Square comes alive with lights galore and special events including holiday crafts, a winter beer garden, gourmet hot chocolate stands, cookie decorating, carousel rides, mini golf, a light show, and visits with Santa and Mrs. Claus on weekends between November 15 and December 31. Over in Camden, the ​Adventure Aquarium's Christmas Celebration offers visitors a chance to meet Rudolph the Red-Nosed Reindeer, take a virtual ride on the polar express, and see a scuba-diving Santa Claus while enjoying all of the usual attractions from November 26 through January 2. Just a little southwest of the city at the Longwood Gardens, "A Longwood Christmas" gives visitors a special seasonal treat that features illuminated indoor and outdoor displays of plants, ornaments, and fountains along with the Garden Railway, special events like Breakfast with Santa, and performances by ice skaters, strolling carolers, and a choir. The Longwood Gardens Christmas event runs from November 22, 2018 to January 6, 2019.